The Callaway Big Bertha Alpha driver pairs together the new Hyper Speed Face™ technology with ground-breaking Gravity Control adjustability technology, an adjustable weight system and an advanced adjustable hosel to deliver incredibly faster balls speeds, a larger sweet spot for the ultimate in distance and forgiveness. The breakthrough feature of this driver is the Gravity Control technology system which allows a player to adjust backspin independently of launch angle by changing the Gravity Core. 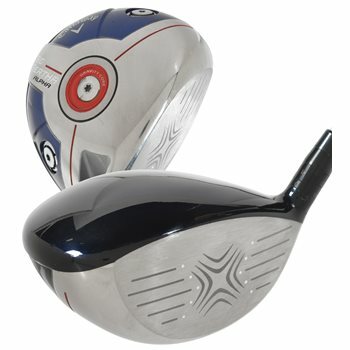 Along with the improved Hyper Speed Face™ technology, this lightweight 460cc driver also has moveable weight technology in the heel and toe and the advanced adjustable hosel technology which has allows a player to adjust the loft down 1° and up 2° from the original loft setting and also allows directional control from Draw to Neutral bias for the ultimate in pinpoint accuracy. This driver is such a game changer it deserves to carry one of the most legendary names in golf. Adjustable Perimeter Weighting system allows a player to interchange weights in the heel and toe of the driver head to improve MOI and maximize draw or fade bias. Advanced Adjustable Hosel technology which lets a player to adjust the loft down 1° and up 2° from the original loft setting and also allows directional control from Draw to Neutral bias for pinpoint accuracy.